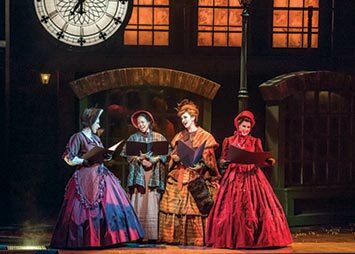 Lyric’s “A Christmas Carol” Inspires Audiences with the Charming Novella by Charles Dickens. Lyric Theatre is presenting the favorite classic by Charles Dickens “A Christmas Carol” to Oklahoma audiences through December 24, 2018. This Christmas extravaganza is an Oklahoma City favorite. Michael Baron directs with flair and he also adapted the production from the novella, taking advantage of the novel attributes within the Lyric facilities to facilitate a very polished production with the special Baron touch. He uses fragments of Walt Disney combined with a bit of Blake Edwards and a snippet of John Ford but not a smidgen of Clint Eastwood. It’s a light touch and Dickens would certainly be as thrilled as Oklahoma audiences are, especially the younger set. Dickens wrote “A Christmas Carol” in 1843 against the backdrop of the industrial revolution. The social upheaval that occurred during this time gave rise to over-populated ghettos filled with privation. The privileged enjoyed an opulent existence, adhering to the strict social mores of the Victorian era surrounded by ostentation and glamour. The difference between the two extreme conditions of wealth and poverty is glaring. Until the development of a prominent middle class, those in need had little hope of advancement, merely surviving becoming a significant achievement. Baron’s adaptation reveals the plight of the unfortunate hidden behind the arrogance of greed and miserliness sensitively and respectfully. The extraordinarily beautiful sets and costumes reveal the façade of beauty and grace Victorians idealized. A stark contrast is formed from the stooped shoulders of Cratchit as he huddles over his books with only a small scratchy blanket shielding him from the cold. Yet Cratchit’s faith in God’s plan for him never wavers. He is meek and mild in appearance yet strong in his convictions. Dirk Lumbard is Ebenezer Scrooge. The stiff and stuffy gentleman has a baleful glare as he guards his hoard. 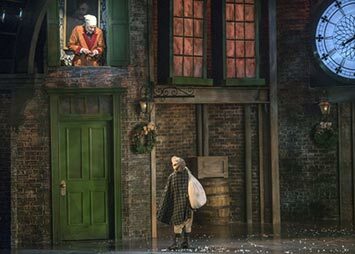 Lumbard adds an undercurrent of humor to Scrooge that lets us know he may be worth saving. Slowly as the play progresses the cruel glance becomes an inclusive twinkle, the gruff grunt becomes droll laughter, the superior sneer become humorous wit. Lumbard is tall and lean, but as Scrooge he is towering and scrawny. Once he awakes on Christmas morning he is, once again, tall, and lean in memory of his youth. Scrooge remembers how to tease and Lumbard teases with a natural impunity that tears at the heartstrings. Standing by his younger self, played by Andi Dema, the physical differences seem more natural. Thomas E. Cunningham is Marley, the partner dead for seven years. Scrooge and Marley were suited as business partners; Marley was just as avaricious as Scrooge. Returning as a ghost, he terrorizes Scrooge, preparing him to face his faults and save his soul. Cunningham is brilliant, showing us a nightmare image galvanizing Scrooge to accept the lessons to come. 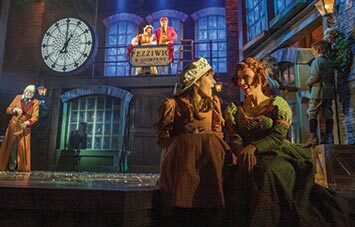 As Scrooge remembers his past, a wonderful character emerges; Scrooge is employed as a youth by the generous hearted and fun-loving Mr. Fezziwig. Cunningham makes an amazing change with these two completely different characters lodged in the one actor. Charlie Monnot is Bob Cratchit gifted with a kind soul, a generous heart, a loving family and a strong faith. These are priceless gifts, yet they are worth nothing in the marketplace. Resigned to his subservient position, he takes joy wherever it can be found and courageously defines his position with optimism and love. Monnots creation of this simple man is a complicated challenge met with supreme elegance. Kizzie Ledbetter is Mrs. Cratchit, diligent and hardworking she is more practical than her husband, and although more realistic than forgiving, she reveals her faith in her husband as well as her Creator. Ledbetter is equally masterful in expressing the complexities of caring in a careless environment. Matthew Alvin Brown plays Topper impressively. Within a few short moments a shy bachelor who is also a somewhat of a ladies man emerges with amusingly scattery mannerisms. Brown also conquers several other roles with solid distinction. Andi Dema portrays the young Scrooge as well as Scrooges nephew. The two characters are quite similar, yet Dema is able to capitalize on the differences with smoothly graceful distinguishing attitudes. Playing opposite Dema as young Scrooge is Lexi Windsor as the pretty and loyal Belle, firmly righteous as well as gentle. Jennifer Lynn Teel also plays opposite Dema as Nephew, Fred. The two women are completely different, helping to further distinguish Dema’s two characters. Teel is delightful as Mrs. Fred and Susan Riley as her plump young sister is equally wonderful in her rapport with Topper. Windsor, Teel and Riley are three distinctly different actresses bringing a wonderful range of talent to “A Christmas Carol” in their various roles. Brenda Williams plays Mrs. Dilber. In addition to this role she is Mrs. Fezziwig and a laundress with delicious unsavory scruples and both of them are delightful. Williams has a long standing history in theatre as a stable and efficient character actress. As such she exhibits an uncanny brilliance, reading her audience like an open book and creating chemistry. As a member of the community in Dicken’s London, she works closely with Brown in his role as an inhabitant of London. The two of them together set up the play so that we have all the necessary background, but they do so with charming wit. The three spirits visiting Scrooge are exciting, and just scary enough for us to sit up and take notice. The Ghost of Christmas Past is portrayed by Natalya Fisher without subtlety but with lots of sensitivity. She floats above Scrooge encircling him with memories as well as flying above the audience with beauteous bravura. As she shows Scrooge his past she gently leads him into understanding how his younger self lost the way. Fisher is an athletic performer secure in her fly system. She is glamour personified and Fisher does not let her glittering façade overpower her message. The Ghost of Christmas Present is Mateja Govich, a veteran performer with amazing stage presence. His commanding voice is as impressive as his stage presence is accomplished. These two performers are essential to Scrooge’s epiphany; they control Scrooge’s drastic transformation from intense frugality to lavish munificence. The Ghost of Christmas Yet to Come never speaks only indicating by gestures. He has no face, and is operated from within by strings as a large puppet. Though he has no features he expresses much: he is a technical masterpiece in design, operation and costume. Many find him the most frightening spirit; he is Scrooge’s last chance. Of course the most famous line of the show is uttered by the smallest member of the cast. “God Bless us, everyone.” The invalid son of Bob Cratchit is Tiny Tim whose life may be shortened by his ill health, but his inherit loving spirit cannot be defeated by circumstances. He is played by Seth McConnell of the Holly Cast. Lyric’s production of “A Christmas Carol” involves a number of children and a number of hours for young actors. Having two separate casts of children allows them the rehearsal time needed without overwhelming them with constant rehearsal. The Ivy Cast and the Holly Cast play alternate performances. McConnell’s counterpart in the Ivy Cast is Taylor Grigsby, and they are both delightful young performers. McConnell displays supreme confidence along with gentleness making the Cratchit family complete. Camille Matlock from the Holly Cast is an excellent Martha, with a teen-aged exuberance and a sense of humor about her although she is already in the working world. Her lovely counterpart is Emily Trinka. Braden Henson is Peter Cratchit, almost a young adult, but clearly connected to the family with his contributions. He also appears as the perfect Scrooge on the brink of adulthood. His counterpart in the Ivy Cast is Nate Peterson. Serena Feng is the delicate Fan, sister to the young Scrooge who becomes the mother Fred has never known. Her ethereal presentation is delightful. In the Ivy Cast Fan is played by the equally talented Emma I. X. Wells. Eleanor Harris is Belinda, a delightful sister to Tiny Tim, with just enough imp to be a best friend to the young disabled boy. In the Ivy Cast, the role of Belinda is played by Erin Thompson, who is reputedly an imp in her own right. Myles Currin-Moore is a School Boy and he romps with enthusiasm, rounding out the group of children. In the Ivy Cast Ainsley Manners is only slightly more demure. Colton Anderson is very well done as the Turkey Boy, meaty enough to carry the prize turkey. Zenon Hendrix from the Ivy Cast also has a turn as the ‘intelligent’ child Scrooge hires to purchase the prize bird for Cratchit’s dinner. Many cast member have slight accents, while some are more broad-it is a treat to have the accents be light and understandable; yet with enough spice to add flavor to the dialogue. Nicholas Bartell is the dialect coach, striking the perfect spoken balance meeting Baron’s auditory concept. All of these stars shine because of the excellent technical mastery by crew members such as Jeffrey Meek with authentic and elegant costuming, mirroring Baron’s visualization. Penny Benson is the Puppet Designer; essentially she has the role of the Ghost of Christmas Yet to Come perfectly realized. Ashley Wells, Choreographer, lends precision to each motion. Kimberly Powers is a master at scene design; the set is defined intelligently and exquisitely. Lyric’s “A Christmas Carol” can be enjoyed through December 24, 2018. Performances are Wednesday and Thursday evenings at 7:30 pm, Friday and Saturday evenings at 8:00 pm, and Sundays at 7:00 pm. The Lyric Theatre is located in the Plaza District at 1727 N. W. 16th Street. Visit www.lyrictheatre.com for information or to purchase tickets simply call the box office at 405-524-9312 between noon and 5:30 Monday through Friday. An evening with Dickens classic tale “A Christmas Carol” visiting Lyric is a magnificent way to remember the season with charity!